Grommet top curtains are my go to choice for window coverings for a few reasons. First, the grommets make sliding the curtain panels open and closed really easy. Second, curtain panels are a great way to add softness, color, or even pattern and texture to a space. 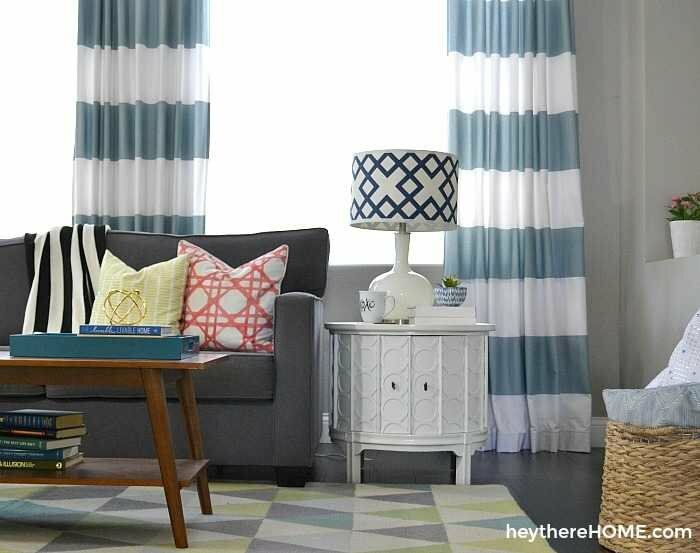 But that much fabric has the potential to break the budget and really good quality grommet top curtains can also be expensive, but don’t worry. I’ve got a secret source for amazing fabric that will get you the same look as some of the designer stores. My secret is to use fabric shower curtains and today I’m going to show you how to make grommet top curtains with them. I’m all about getting the exact look I want without breaking the bank and learning to sew a straight line so that I can make my own home decor has been the best thing I ever did. 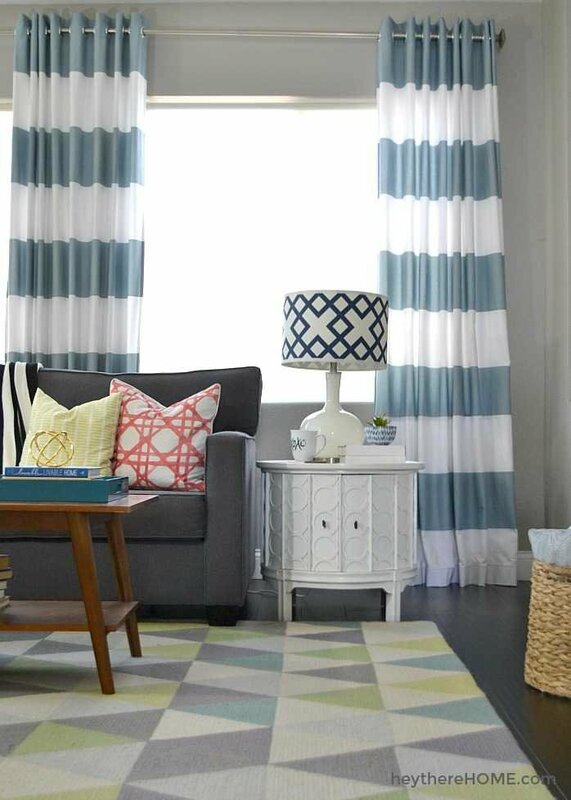 I originally fell in love with the look of these bold stripe curtains when I saw the Alston curtains from Crate & Barrel, but I just couldn’t swing the price. I definitely knew that the bold stripe was the look I wanted so I set out to find a way to get the same look on a tighter budget. 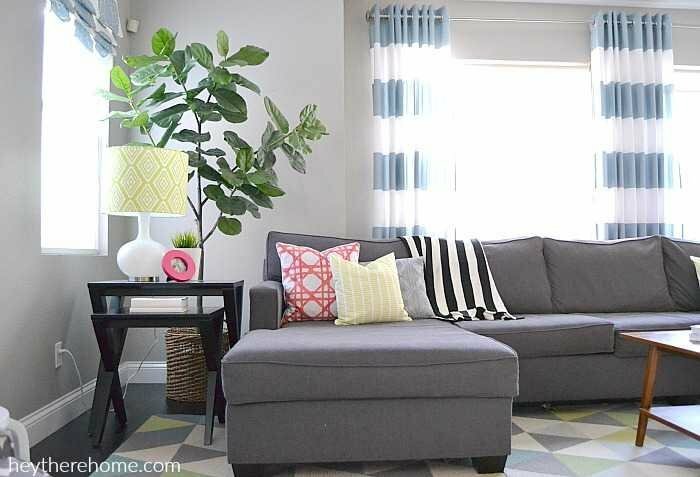 It turns out that finding fabric with this bold strip to make grommet top curtains from scratch was hard to come by, but since bold stripes are a classic, it was pretty easy to find fabric shower curtains in many different color options. Turns out that fabric shower curtains are the perfect weight of fabric for curtain panels and using them also meant that many of my seams were already sewn for me! Win-Win! Grommet top curtains function the best (slide open and closed) and look the best (lay really nicely) if they have a lot of structure at the top and have evenly placed grommets. Using grommet tape made getting the spacing and the structure needed for a really high end look so stinkin’ simple. Grommet Rings: The number of rings needed will depend on how many panels you are making. I used 16 rings per panel/ shower curtain. Note: You will need to know the measurement of your curtain rod before ordering grommet rings. There are different sizes. These ones are for rods up to 1 3/8 inch, and these ones are for rods up to 13/16 diameter. Sewing Machine: This is my favorite sewing machine for home decor projects. It sews through thicker fabrics without a problem, isn’t complicated, and isn’t expensive. Fabric Shower Curtains: You will most likely need 2 curtains per panel depending on the height of your ceiling. Double check the dimensions of the shower curtains you purchase. Step 1: Cut your shower curtains to create your curtain panels. For a floor to ceiling panel you will need 2 shower curtains. I used the bottom hem of one shower curtain as the top hem of my curtain and then cut off the bottom hem about 1 inch below one of the stripes as far down as I could. Then I cut the hem off of a second shower curtain about an inch above or below the stripe of the opposite color. Step 2: Sew the 2 shower curtains together to get your desired length. Sew the 2 pieces together right at the edge of each stripe so that when they hang you can’t tell that there is a seam and the stripes continue seamlessly. Step 3: Prepare your bottom hem. I prepared my bottom hem by folding the fabric over twice to make about a 2 1/2 inch hem. This gives the bottom of the curtain some weight so it will hang nicely. Step 4: Apply the grommet tape. Using grommet tape makes this pretty much fool proof. I laid my tape out along the back side of my curtain about 2 inches down from the top and pinned it in place. Then, following the instructions that came with the grommet tape, I sewed along the yellow lines. Using scissors, cut out the fabric circles using the grommet tape as your guide. Once your circles are cut, snap on each grommet ring. Hang up your new grommet top curtains and give yourself a high five! Another way I saved a bit of money was to cheat a little bit. See how 2 of my panels go behind the couch? Well for each of those, I only used one shower curtain! That’s right! You can’t see that they don’t go all the way to the floor and this actually makes them easier to close when needed. I can’t wait to see which shower curtains you choose to make your own grommet top curtains! Hi Corey i love your ideas! I however do not see but I’m willing to pay for it to be done! Do you have any options? Hi Nehemiah, I suggest looking for people in your local area who can do the work for you; perhaps placing an ad on Craigslist. Good luck! We are about to close escrow on our home. I love your idea for curtains! You said they don’t go to the floor, but it looks like they do. No matter. Great idea! Thanks bunches, Robin and best wishes for an amazing new home! Love, love, love these! HOWEVER, I don’t sew. Can these be done by using fusing tape? I can’t seem to find any grommet header tape. Any help? Hi, Cee! You can find grommet tape at Amazon (it’s linked in the supplies & cost list on this post). Best of luck! I love this DIY, it’s so helpful. I am also super curious about your curtain rod. Is it just one, long, single rod with no middle support? Would you mind sharing your source? thanks!! I love your curtains. I’m no looking to make the curtains. I am wanting to add grommets to some drapes I have in our master bedroom. They are kind of a heavy thermal backed fabric that I bought a number of years ago. I love them, but they are difficult to open on the rod. I would like your opinion on whether you think it will work. I think they will work! I love grommets because no matter what kind of fabric it is they can open and close easily. I say go for it! Hi Linda! I was always so afraid of trying grommet top curtains too but once I used the grommet tape it was a life changer! It makes it almost fool proof. I’d love to see the end result, so be sure to send me a photo when you are all done. Have fun creating! Corey used a Roman shade on the smaller window. You can make them yourself by sewing in rings, or using ring tapes. I like the decorative bottom she has on hers. OMG! These are gorgeous! I love this look and you chose my favorite color. Fantastic job and thanks so much for showing us how we can do it. You rock! In your post, you said that depending on the height of my ceilings, I’ll most likely need 2 shower curtains per panel. Is this because one shower curtain won’t reach the floor? And if this is the case, can I really just buy 3 shower curtains and use the extra shower curtain to make the other two longer? I’m due in less than two months and really wanting to get my son’s room ready. I saw these curtains but really didn’t want to pay $70 per panel. I love the way yours came out! Hi Jessica! Congrats on your upcoming babe! That is so exciting 🙂 To answer your question, you it totally depends on your ceiling height or the height of your curtain rod and the dimensions of the shower curtain that you purchase (which you can find online.) My ceilings (and my moms) are particularly high so we had to use 2, but your ceilings may be lower and if that is the case the answer to your question is yes! I hope that answers your question. Feel free to email me directly if you need more help! 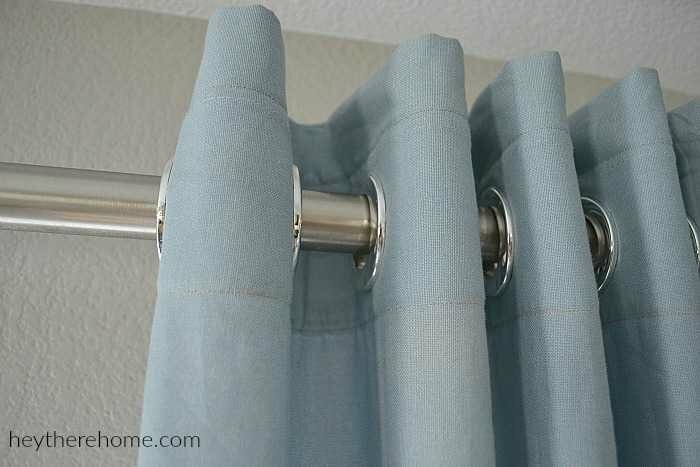 I have used shower curtains for curtains in several homes…only I hung them with ring clips. I’ve been curious to try grommets, but a little afraid. That grommet tape makes it look ridiculously easy! Thanks so much for the the step-by-step…and for including the product links. You are very welcome Bristol! You will love the grommet tape. 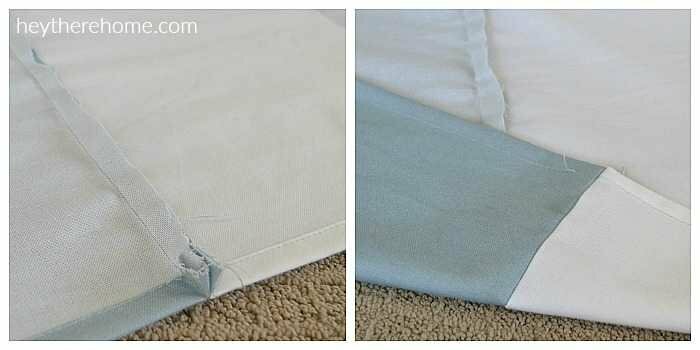 It makes it so easy and give the top of the curtain the weight it needs to lay perfectly! 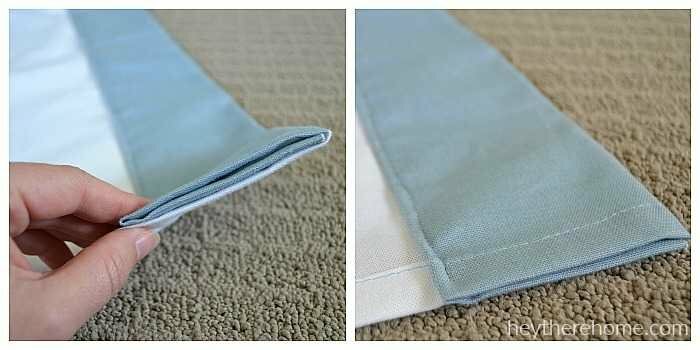 If you can sew a straight line, you can do grommet top curtains! Hooray! Those are great! I’m not into stripes, but they really go great in your room. I’ve made simple curtains for years, but I bought some cute tab top ones with pockets for my front room. I put things in the pockets that I don’t want to lose track of. I don’t have need of a living room, even when I did have people over, we always congregated in the kitchen, so I use the front room as my office/craft area. Thanks so much for the awesome idea! I wanted navy horizontal stripes for my nursery and this was such a great solution vs. getting something custom made. I just wanted to warn others that the West Elm curtains are not uniform–the length of stripes and color varies per panel. They’ve still turned out really well but just beware as you order and before you cut! I just recently found your blog and signed up. Boy, am I glad I did! I will start this grommet project next week. A m a z I n g. Can’t believe I didn’t think of shower curtains, so I’m glad you did! I love these! Also loving your couch with the deep cushions! Where did you get the sofa?? I got it at a knock off furniture store in my area. Most cities have them and they are usually found in industrial parks and have some samples in the showroom and then they have photos from all the big brands like Pottery Barn and Crate and Barrel for inspiration. Then you order through them and they work with furniture makers that do the same style for less. The one here in San Diego is called Roomers. These are beautiful! Thanks for the tutorial! I actually first spotted this curtain design while relaxing on the bed mattress in a hotel a month ago. Been looking at these but can’t really swallow the price. Really glad I found your blog. Thanks again! Don’t you just love getting inspired in hotel rooms! So glad I could help you imagine pulling off the same look for less cash and glad to have you here! Love what you did!! I’m wondering where you got that extra long curtain rod? Do you know, by chance? Thanks! Thank you. I actually cheated on the rod because I couldn’t find one long enough. So I bought 2 long rods and only used finials at 2 ends. Then I attached the brackets to the wall like you normally would but where the 2 rods came together, I stuck one into the other. You can’t see it anyway because I just made sure that it all happened on the back side of the curtains. I hope that makes sense. If not, let me know and I’ll send you a photo. Your curtains are gorgeous! I love the look of the bold striped curtains and have been wanting to make them for a while. Thanks for the helpful tutorial! You are so welcome Katie! I love the bold stripe too. It is just enough interest without being busy. Hope you are having a great week! These are gorgeous and remind me of something I did similarly – I made grommet curtains from tablecloths – which can be in many varying lengths and widths, still lightweight, and fairly inexpensive compared to real curtains, and sometimes shower curtains! And I love your stripes! So genius! I will be copying this idea for sure! Love, love, love your “curtains”! Hi there, Thank you so much for linking up your beautiful curtains last week at the Link It or Lump It link party! I have picked your project as a feature. Come on over and grab a button and link up again. Thanks! I just love this and will be featuring it on Tuesday at Twirl and Take a bow! Be sure to come and grab a featured Button! Love the stripes and your choice of colors. Great job! I adore these curtains! You did an amazing job!!! I haven’t ever heard of Grommet Tape ~ genius! I love these. I need new curtains for my office and I never thought about using a shower curtain. Pinning! I’d love for you to share this on Thursday’s Be. You. Tiful Link party. We go live Thursday night at 6 PST. Love that shade of blue! Did these come from West Elm because I’ve never seen that color before? Well done! Great tutorial, too! WOW. These looks SO professional! You did an AMAZING job, Corey!! I am all about a great knock off! I like your version better than theirs! Corey these are awesome and I was just showing Eric these curtains in the catalog I got on Saturday! I was also eyeing the big sur table and bench that are just a tad out of our price range, haha. LOVE this and everything you do in your home! Beautiful! They turned out perfectly! Nice job on DIYing them yourself. Although I have to say you are stressing me out a bit with your 7 year old gift cards. Hahaha…. No expiration date? Stunning! I love striped curtains!! Yours came out lovely! Thanks Selene! The bold stripes are exactly what my room needed. Have a fantastic week! These are great Corey! I’m so glad you did a tutorial on making these out of shower curtains because I’ve been thinking about doing this myself and I wasn’t exactly sure how they’d work or look. So thanks for the inspiration! No prob leelee. These shower curtains were perfect, because they are a nice fabric and a whole lot cheaper option. Thanks for stopping by! You just keep cranking out the beauty here! Love these curtains. West Elm and Crate + Barrel, my number 1 and 2 top spots! Love love how your curtains turned out! Thanks Amy! Those are my top 2 too. Am I the only one who gets overwhelmed in those stores. Not because I don’t know where to start, but it is like a creativity binge! Haha. Well thank you so much! Thanks for stopping by. Have a great week! Wow – those came out perfect! 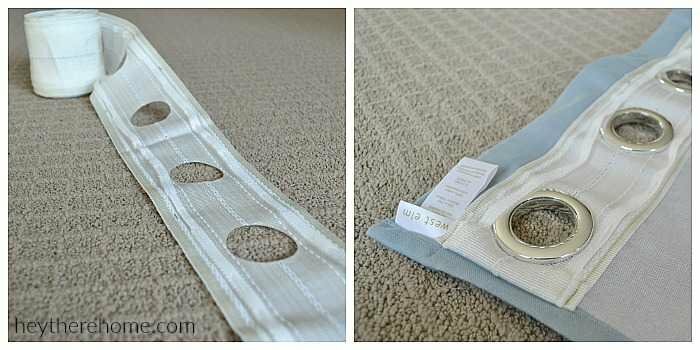 I’d never even heard about grommet tape – I wish I had seen this before I just purchased curtains for baby’s room, haha 🙂 Great tutorial! Visiting from the Link it or Lump it party! This was my first time using grommet tape and it made the project super easy! Keep it in mind for next time for sure. Hope you have a fantastic week! LOVE the color you chose to – just beautiful! You’ve got to try using grommet tape if you ever make curtains! It makes everything super easy. Thanks for stopping by Amy! I was just in your neighborhood today…my cousin lives there! Ha. Small world.